I am very fond of the 4th of July. It has always been one of my favorite holidays because it seems to just describe what summer is all about...warm beautiful weather, fun times with family and friends, and traditions that never get old! This year was a little different because both of my parents had to work and because West Point cancelled their annual survivor event due to "budget cuts". I still had a way fun day though! And I personally loved that Utah celebrated on the 3rd because it made for an extra long party weekend! I wasn't sure that I would be able to run that early in the morning. We were all pretty tired before the run! I actually found it a very pleasant time to run. The temperature was perfect! We were pretty excited we both got drawn from the raffle. I won some running socks, a water bottle, and a protein bar. Hollie won a huge can of beef jerky that I was really jealous of, a bag, and some shoe laces. I told Karen I was going to beat her next year but her time this year was 24 something so I highly doubt that will happen. But you bet your britches, I'll try! Hollie's grandma wore her snuggie like this the entire parade even though it was burning hot by the time it was over and I just thought that was adorable. It was very fun even though I got burned despite my efforts to stay sun screened up! Wel all brought something...I brought a salad, Brit brought the turkey steaks, Steph brought corn on the cob, Hollie brought homemade mashed potatoes from KFC, and BreeAnn brought dessert. Thanks Darin for grilling the turkey steaks! They were so yummy! After the BBQ, we went to West Point's fireworks but I fetching forgot my camera which I was not too happy about. They were just delightful though! And after the fireworks we went back to the Smiths for BreeAnn's dessert of brownies and ice cream. Thanks guys for a very fun filled 4th/3rd of July! Last year my good friend Hollie M rode in a bike ride on antelope island called the Moonlight Ride. BreeAnn and I went to see her come in and she seemed to be in pretty good spirits when it was over. She even came over and hung out for awhile after even though it was really late at night! So, this little idea popped into my head that maybe I could handle this bike ride. I mean, it seemed like it would be a pretty fun experience. So, I started mentally preparing myself to join Hollie in the Moonlight Ride 2010 right there and then! Let me repeat, I began MENTALLY preparing myself. I didn't actually start practicing on a bike until a few weeks before the ride. Hollie is my friend so therefore I trust her but I am not sure why anymore because she flat out LIED to me about this ride! I swear she told me multiple times that there was ONE hill I needed to be worried about. I stressed and stressed about this ONE hill! This ONE hill pretty much consumed my thoughts for months. I finally just told myself I would do the best I could and if I had to walk my bike up part of this ONE hill, then so be it. So, when my mom and I started the ride and my legs instantly had a hard time pushing against the force that was what seemed to be a hill, I thought to myself, "Perfect! We can get the hill out of our way right at the beginning and the rest of the ride will be a breeze." I asked my mom (who had done the ride a few weeks earlier and had also lied to me about the ONE hill thing) if this was the hill her and Hollie had referred to. She laughed! She had the nerve to laugh! She informed that this was indeed not the hill that had haunted me for months. I knew I was in trouble. I pretty much thought at that point that there was no way I was going to finish the ride. But I am proud to say that I did finish it! Yea! And I didn't even have to walk my bike at all. Say what? But that doesn't mean that I didn't have to stop about every five seconds but still! My mom said she had never coasted so much on a ride. Ha! Sorry mom! But seriously, I really appreciate her doing the ride with slow poke me. My goal for next year (I am actually shocked I am thinking about doing this ride of death again.) is to not have to stop at all! The ride was on June 25th at 10:00 at night so the plan was to leave my dad's birthday party around 9:00 and meet Hollie and company there right before the ride started. Things didn't quite go according to plan! Maybe I wasn't supposed to do the ride because pretty much everything that could have gone wrong, went wrong. My mom couldn't find our tickets, my headlight wouldn't work, both bikes needed air in the tires, and by the time we got to antelope island, there was a HUGE line of late comers like us. So, unfortunately Hollie and her dad had to start the ride without us. I was pretty sad about that because I though maybe Hollie and I would be closer to the same riding skill. My mom is way better than me so I feel bad that she had to go so slow with me! We didn't start the ride until after 11:00 so there were people already on their way back (show offs), so I made it my goal to make sure Hollie was not a part of any of those groups so we could ride the way back together. They didn't find me yelling, "Hollie Joy Marshall, are you there? Are you a part of this group?" in a loud horrible english accent as funny as I found it...When my mom and I got to the ranch where they serve snacks and water, I thought there was no way I was going to be able to find Hollie. There were like a billion bikers! But right as I started walking down the hill, a Glee shirt caught my eye...it was her! I had found Hollie! I pretty much consider this a miracel considering the swarms of bikers. So her dad, aunt, and cousin headed back and Hollie waited at the ranch with my mom and me to ride back with us! The ride back was pure HELL. The wind was blowing like crazy and I am pretty sure I ate lots of bugs. But it made it a lot easier to have Hollie next to me! We tried to laugh at our misery. My mom would ride ahead of us and wait for us slow pokes so it was also good for her that she could go at her own pace. All in all, it was a really fun night and I am glad I did it! I just definitely want to be in better shape next year. Apparently it is not as hard of a ride as I am making it out to be because there were little children doing it! I consider that child abuse but whatev. Us before the ride, looking chipper...I obviously didn't know what I had gotten myself into. Yea! We found our friends! I was pretty happy to get some snacks. Of course. I guess I don't understand why Hollie doesn't look tired. The theme was vampires and this lady was the only one that went all out so we asked for a pic with her. My mom looks funny. And dead. It was very late and we were very tired. I am not going to lie, 50 seems so old! But I think my dad makes it look pretty good. A few months ago Aubrie and I decided it would be fun to throw my dad a surprise birthday party for the big 5-0. I could never be a party planner I decided. The whole thing really stressed me out for some reason! I am glad we did it though and I think it was a success! We had it at the East Park on June 25th. When we were setting up the wind was blowing really bad and I was really thinking that nothing was going to work out because nothing would stay on the tables. Ugh! Talk about frustrating! Thankfully the wind died down and the table cloths finally stayed. The surprise was supposed to be at 6 and guests were supposed to arrive at 5:30...good thing everyone runs on Gunter time because Aubrie and I did not get there to set up until about 5:20! The surprise ended up being at like 6:30 and all was well. One thing is? I have no idea why I just chose to bore you all with those stupid lame details. It's late, ok? 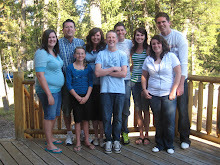 I am really grateful toward everyone that came, especially those that traveled all the way from Pocatello. I do not have all of the pictures from the partty because Karen was nice enough to take a bunch for us on her nicey nice camera. I guess this is as surprised as he gets. His actual birthday was on the 14th so he just kept saying, "My birthday was 2 weeks ago." Like we were crazy for doing it a little after so he would really be surprised! The birthday boy and his beautiful wife. The Barkers and big brother Bryson. My grandma and grandpa Boyd. They look jolly. My mom and her bestie Carol. Cousin Jodie and Grandpa Boyd. Aunt Doris, cousin Jonie, Aunt Sydney, Grandma Gunter. Grandpa Gunter and cousin Jace. Bryson, Grandma and Grandpa Boyd, Uncle Bob and Aunt Donna. And creepy weird posing family. I love my dad very much and don't know what I would do without him. He is so willing to help us kids out in whatever way he can. He is a great example to us! I hope he had a good 50th birthday cause he deserved it! I love you Dad! I am attempting to play catch up on my blog and apparently nothing substantial happened between April and June. That's ok because me becoming an aunt tops it all! That's right folks, Sawyer Clark Gunter made his debut into the world on June 15, 2010 at 11:10 PM weighing in at a whopping 8 pounds 9 ounces, making me one proud happy aunt! I have been looking forward to having nieces and nephews for a long time. I have always been jealous of my friends because they have like billions of the little rascals. Sawyer was definitely worth the wait though! While Jaclyn was in labor we all waited at their apartment to meet the little guy. We were getting pretty antsy when it had been well over an hour from the time Bryson told us she was going to start pushing. Like every 5 seconds my mom would ask us if we thought everything was ok. Thankfully, everything was just fine! I guess he was just a little apprehensive to come out and meet all of us crazy faces! I don't blame him really. 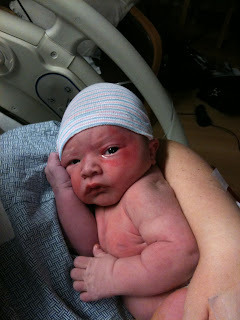 After what seemed like hours and hours, my mom finally got a text from Bryson saying to come meet her new grandson! Eek! How exciting! We all jumped up from the couch and rushed out the door! I don't think I will ever forget that moment because my entire family was just so excited and it didn't seem real. I am so glad baby Sawyer is here and healthy! He is so stinkin cute and I know we will all have so much fun watching him grow up. I love you Sawyer! P.S. I am only posting a few pictures because my camera broke, (one reason I feel I have been so slackerish in the blogging department) so my parents have all the pictures of him in the hospital and what not. But I am sure he will be on my blog frequently in posts to come! This is the very first picture we got of him on our way to the hospital. Isn't he handsome? His little eye was bruised from the forceps. He had kind of a rough landing, the poor little guy. Yea, I am so happy to be an aunt! And I feel like he might really love me already. Look at me! 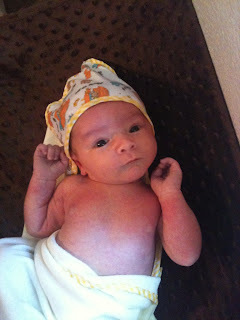 I am all clean and very cute! In honor of the season premiere of Glee we planned a Glee themed PARTAY! All of us gleeks (minus Holly because she lives in dumb Meridian), gathered at the Smith residence for some food, fun, and quality Glee time. The night was way fun! I was just a little disappointed about the turn of events that took place in the show but it has since redeemed itself! I can't wait for it to start up again in the fall...I am going through some serious Glee withdrawals. BreeAnn and I picked up Artie for the party. Artie did something ridiculous on the way over that deserved a slushy facial...dumb kid. I have no idea what they were trying to accomplish, but they both looked too attractive to not post this picture. 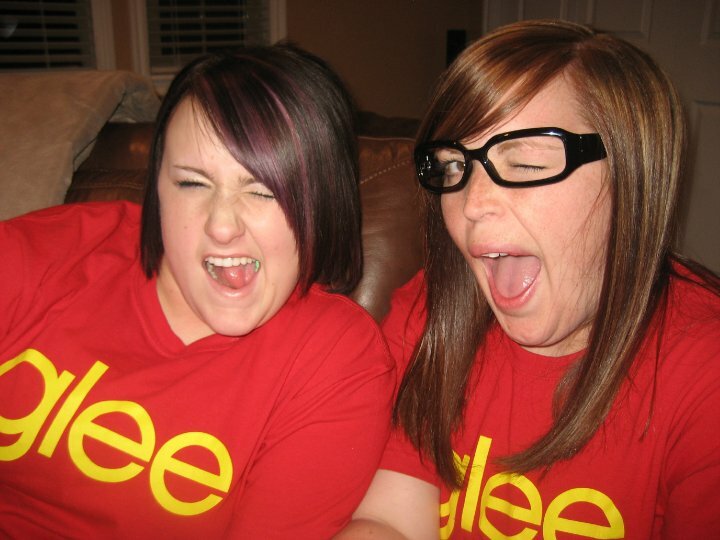 We're proud to be GLEEKS! One thing I feel the need to mention about this night is that the Smiths made dinner for all of us and that dinner changed my life. I get pretty excited about food and this meal was no exception! They made this concoction they call mango chicken wraps and they are heaven on earth. So, Dena if you are reading this, I would not be opposed to another Glee night when it comes back on in the fall and maybe mango chicken wraps should just be tradition? Just a suggestion, do with it as you will! I love Glee! Whoops! I know it has been awhile, but what can I say? I am an incredibly busy girl! But I had to enter back into the blogging world just so I could talk about the new phenomenon that is glee! I really could not love this show more than I already do. It has totally changed my life. I have always felt that with a little vocal training, I am the next broadway sensation, and this show has just made me all the more confident in myself! Rachel is definitely my favorite character because we have so much in common...outstanding voices, very driven, incredibly beautiful, etc. So pretty much I just wanted to give a shout out to my new favorite show since the premiere is on Tuesday and it is really all I can think about these days! Well that and Disneyland. Make sure you watch and enjoy! 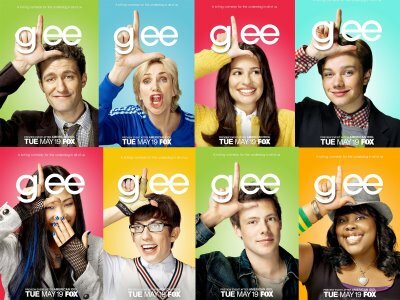 I love glee!